This page lists all reports that for Canada including those that involve other countries too. Click here for a list of reports that involve only Canada. Concludiamo con questa pagina il racconto del ciclo-viaggio di Renato Frignani dal Canada al New Mexico denominata Great Divide Mountain Bike Route. Il percorso degli ultimi 1200 chilometri. We conclude with this page the story of Renato Frignani's cycle-trip from Canada to New Mexico called the Great Divide Mountain Bike Route. The route of the last 1200 kilometers. Great Divide Mountain Bike Route, dal confine Usa a Yellowstone Park. Con l?avvicinarsi agli Stati Uniti il paesaggio dolcemente si appiattisce, prevalgono colline e allevamenti di bestiame, ranch e piccoli villaggi. Roosville è la porta di accesso agli Stati Uniti: il Montana ti dà il benvenuto ed è anche lo stato dove si percorrono più chilometri. L?ingresso negli Stati Uniti presenta un paesaggio dolce ed accogliente, campagne e ranch mi accompagnano fino alla cittadina di Eureka. Da qui in poi inizia la vera sfida con il selvaggio, le foreste e i continui saliscendi. Inizia la pubblicazione di un Grande Ciclo-viaggio, mai raccontato come lo trovate scritto qui. Una splendida collaborazione con l?autore Renato Fignani vi porterà conoscere un sentiero famoso che solo i piùti di voi potranno percorrere, ma che tutti possono stupirsi leggendolo. People deal with the plights of life differently. When something major happens, some become mentally paralyzed and others just go and do. I was getting to that point where I couldn't do anything, so I decided to do something that wouldn't let me hibernate-I biked the Pacific Coast by myself. Vancouver to Squamish to Bowen Island, back down through Vancouver to Washington, through the Islands, over the Olympic Penn., and then down the WA, OR, & CA coast. A complete circuit of Newfoundland's beautiful Avalon Peninsula. 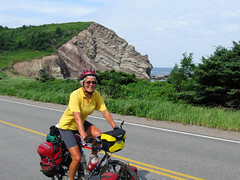 Six days and 778 kilometers through rain, drizzle, fog, thunder, lightening and even some sunshine. With maps and elevation graphs. Touring the world with Warren Music and Baba Spokie. Come see the adventures of Warren Music and Baba Spokie. Our website shows tours we have done in Asia and North / Central America. on bicycle. We have commentary, gear/kit analysis and recommendations and everything a bicycle tourist would like to read about. I live in Berkeley, California and my friend John lives in Los Angeles. 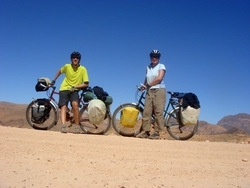 Since 2003 we've been getting together each year to do a modest 7-12 day bike tour. Our criteria include, if possible, light traffic, beautiful scenery, reasonable odds for good weather, and no more than 80 miles between indoor accommodations (so we don't have to lug camping gear). The journals of other bike tourists have been so helpful in planning these trips I thought I should share ours as well. As of 2007 we've ridden on the Oregon Coast, the Central Oregon High Desert, Wyoming (Yellowstone NP, Teton NP, Wind River Valley), Sunshine Coast of British Columbia and Vancouver Island, and Southwest Utah (Zion, Bryce & Capitol Reef NP).